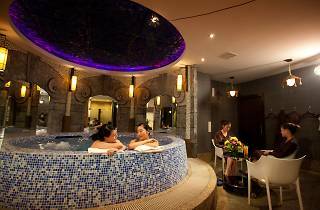 Probably the closest to a public bath in Singapore, this independent spa complex is reminiscent of a Chinese hot springs resort. Upon entering, you’re directed to either the men’s or women’s side and given a locker – swimming trunks, robes and towels are provided, so there’s no need to bring anything. The locker rooms have a hot pool (plus a cold pool for the men – it supposedly improves circulation), sauna and showers. In the common areas, you can relax on comfy couches with personal TV screens, plus there’s an all-you-can eat buffet throughout the day, making it quite easy to spend a full day here (and well worth the basic $68 entry price). Gateway to Vitality (members $122/one hour, non-members $155/one hour). The spa’s standard deep-tissue massage uses Shiatsu-style techniques – you can choose to use oil for a smoother, more relaxing treatment, or non-oil for more direct pressure-point massage. The price includes free roam of the spa’s facilities and buffet.